says "Kaala also known as Kaala Karikaalan, is an upcoming Tamil-language crime drama film written and directed by Pa. Ranjith and produced by Dhanush. The film revolves around the life of a Mumbai-based don Karikalan, played by Rajinikanth. Huma Qureshi, Samuthirakani and Anjali Patil also star in pivotal roles." 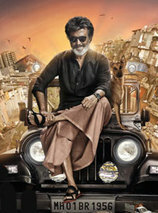 to get instant updates about 'Kaala' on your MyPage. Meet other similar minded people. Its Free! kaala says "Kaala also known as Kaala Karikaalan, is an upcoming Tamil-language crime drama film written and directed by Pa. Ranjith and produced by Dhanush. The film revolves around the life of a Mumbai-based don Karikalan, played by Rajinikanth. Huma Qureshi, Samuthirakani and Anjali Patil also star in pivotal roles." Kaala also known as Kaala Karikaalan, is an upcoming Tamil-language crime drama film written and directed by Pa. Ranjith and produced by Dhanush. The film revolves around the life of a Mumbai-based don Karikalan, played by Rajinikanth. Huma Qureshi, Samuthirakani and Anjali Patil also star in pivotal roles.